The snowy months can get long for children, but you can help make the time pass more quickly with some fun winter crafts. When your kids have gotten tired of playing in the snow, try some of these crafty winter projects to make the chilly days a bit more enjoyable. Think you need to be able to sew to create a blanket? Think again! 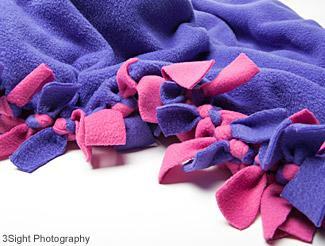 No-sew fleece blankets make special winter gifts, and they can be perfect projects for kids. To keep things from getting overwhelming, limit the blanket's size. A small fleece throw can be perfect for your child's doll or stuffed animal. Help kids measure the animal or doll and write down the measurements. Cut the fleece fabric to be just slightly larger than your child's special friend. Use the scissors to make small notches all the way around the edge of the blanket for fringe. If your child finds this challenging, it may help to create a guide out of cardboard. If you want, you can tie the fleece fringe to give the blanket a more finished look. Wondering what to do with that abandoned mitten? If you've got some extra craft supplies lying around an old mitten can make a great puppet. Since this project involves hot glue, you'll need to help your child affix the decorations. Choose a mitten that is bigger than your child's hand. 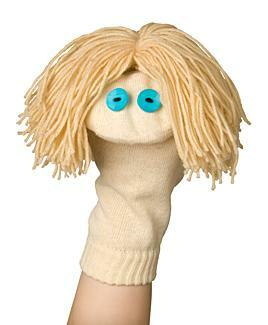 He or she will need to be able to wear the mitten to play with the puppet. Have your child choose eyes and a nose for the puppet, and then work together to cut the felt pieces into mouth shapes, clothing, and accessories. Use hot glue to attach the felt pieces, eyes, and nose to the mitten. Add antennae using the pipe cleaners. Have fun with your new little friend! In this craft you can draw your inspiration from the world outside. Since it requires only minimal cutting and gluing, this can be a great craft for kids to do with little supervision. Lay the cardboard piece flat on the table, and glue down a strip of aluminum foil to create a frozen lake or river. Use masking tape to affix small cardboard boxes to the landscape. Fold pieces of cardboard in half to create roofs. Glue packing puffs on the cardboard to make a snowy landscape. Add pom-poms for bushes. 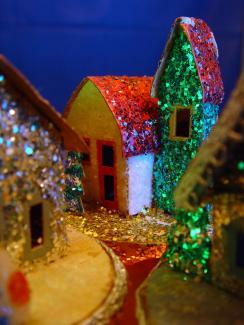 Apply glue to various surfaces and sprinkle them with glitter to give the impression of newly fallen snow. 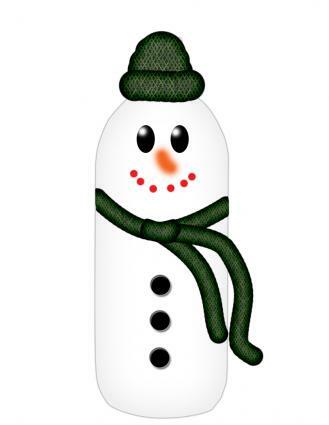 This adorable snowman makes a perfect craft for children in pre-school or early elementary school. Use water-based glue to keep clean-up to a minimum. Draw a snowman shape on a piece of construction paper. Put glue in small disposable containers to make it more easily accessible. Have children dip one side of the cotton ball in the glue and press it on the paper inside the snowman outline. 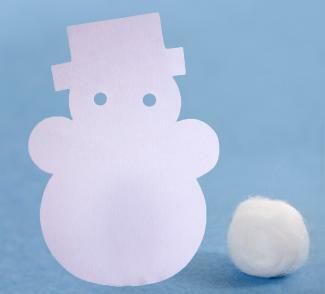 Glue the construction paper embellishments on the cotton balls to give the snowman personality. Brush the background paper with glue and sprinkle on the glitter for a snowy scene. Keeping warm and cozy can be extra fun if kids make their own simple scarves. This craft is best for older children, since it does require a sewing machine. Spread out the fabric, and straighten any uneven edges. Trim the selvedge off of both ends. Roll the raw edges of the long sides up to create a rolled hem. Machine or hand sew the hem to finish it. 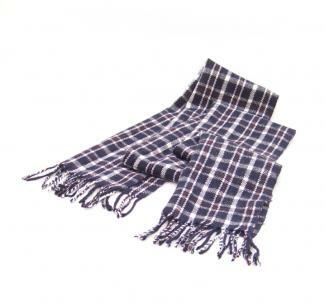 Pull out the threads at both ends of the scarf to make a fringe. This cute snowman doorstop can keep a door propped open or merely act as a friendly decoration in your home. Either way, kids will be proud to see their artwork on display. Paint the bottle with several coats of white paint, allowing it to dry completely between each coat. Fill the bottle with the pebbles or sand, and glue the cap on tightly. Using the black paint, make the eyes, mouth, and buttons. Use the orange paint to create the nose. Use the Sharpie to fill in the small details. Use the sock to cover the cap and top of the soda bottle so that it looks like a stocking cap. Cut another sock to use as a scarf, gluing it around the snowman's "neck." Fingerless gloves can make a fun accessory for kids to show off at school during the winter months, and they're actually very easy to make from an old pair of mittens or cast off gloves. This project is easiest if you use a washing machine, so be sure to supervise younger children. Put the mittens in the washing machine with some soap and wash on hot. Then dry them in the dryer. They will shrink significantly, and the fibers will felt. 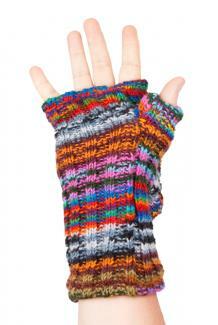 Try on the old mittens and determine where you'd like to cut them off. Mark this spot with a dressmaker's marker. Cut the mittens at the spot you marked. Because the fibers have felted, the mitten won't unravel. These fun winter crafts for kids can be great for spending quality time together. If you work with your child you'll not only be helping with the scissors and glue, you'll be making memories together.